Think you’re too busy to work out? We have the workout for you. In minutes, high-intensity interval training (HIIT) will have you sweating, breathing hard and maximizing the health benefits of exercise without the time commitment. Best of all, it’s scientifically proven to work. Despite the recent attention, interval training is not anything new to seasoned athletes and coaches who have understood the benefits of repetitive high intensity workouts for a long time. Many of the recent studies have focused on previously sedentary people trying to improve basic cardiovascular health, rather than on elite athletes striving towards a performance goal. With that said, we have and continue to encourage climbers to utilize interval training (by it’s nature high intensity) as part of a well-designed training program. Longer intervals, from 5 to 8 minutes, at 70 – 85% of max heart rate work to improve the lactate threshold, the body’s ability to metabolize and clear lactate build up from muscle cells, increasing the amount of work that the body can perform sustainably. A good example is an elite level marathon runner, who is able to sub six-minute miles for over two hours during a race. The intensity that they are working at is very high, yet the body is able to sustain it over a very prolonged period of time. Shorter intervals, from 20 seconds to a few minutes, performed at 85 – 95% of max heart rate (very intense!) increase the body’s anaerobic threshold, it’s ability to perform work while in oxygen deficit. Think Olympic swimmer in the 50-meter butterfly: the intensity that they race at surpasses the body’s ability to clear lactic acid and to provide enough oxygen to the muscle cells for them to continue that pace for a long period of time. The race is very short, however, and for that 20-something seconds, their muscles are able to put out an immense amount of power in oxygen deficit. 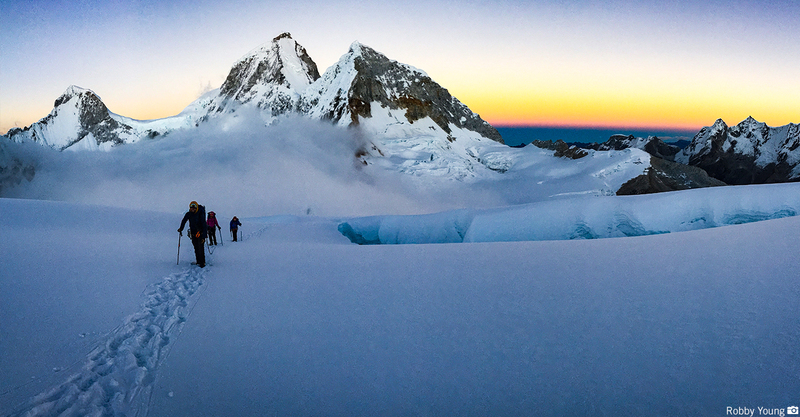 It may seem as though interval training isn’t as applicable to our sport of mountaineering. We tend not to sustain the very high levels of output, but instead operate for far longer periods at moderate intensity. It is the very definition of an endurance sport. Interval training provides other physiological adaptations however that go beyond the abilities of the skeletal muscles. Interval training is shown to increase cardiac output, by increasing the size of the left ventricle, the stroke volume and the overall contractility of the heart. Increased cardiac output supplies more blood to muscle cells, delivering more oxygen and removing more waste. Additionally, interval training has been shown to increase the size and density of mitochondria in the muscle cells. Mitochondria use oxygen to convert glucose to ATP (the cells’ energy source). Both of these adaptations help endurance athletes go longer, faster and with less effort, and ultimately help us in the mountains. Interval training is harder on your body than traditional steady state workouts and requires longer to recover from as well. Therefore, too heavy of a focus on interval training can lead to overtraining and injury. More of a good thing isn’t necessarily better. It’s important to realize that a good training plan maintains a balance of high intensity workouts and lower intensity steady state workouts. As part of the recent HIIT hype, people have championed the fact that HIIT gets more done in less time, even as little as 10 minutes. This may be true for an average person whose goal is to improve overall cardiac health, but for athletes working towards goals in the mountains, remember that there are no short cuts. Time invested in your training will lead to a more enjoyable and successful climb. Questions? Comments? Share your thoughts here!